Lean Thinking: How Long Does it Take to Form a Habit? How long does it take to form a new habit? Popular belief says it takes 21 days. Actually, this is an urban myth with the answer being dependent on a number of variables. Firstly, is the new habit something we like to do or is it something we don’t like to do? As you can imagine, if it’s something we like to do, we can form the new habit much quicker than if it’s something we don’t like to do. Secondly, it depends on the number of repetitions we get. If we practice our new habit once a month, obviously, it will take many months to form a habit whether we like doing it or not. Habits reside in the unconscious mind which means they are automatic behaviors, we don’t have to consciously think about them to do them. It takes time & repetitions for people to be able to perform these new behaviors automatically. So what does this have to do with Lean Leaders? Lean involves forming many new habits that require leaders to behave differently. If these are things we like to do and we practice them frequently, they will become habits quickly. But if these are things we don’t like to do and we only practice them once a month or even worse once a quarter, they probably will never form a habit and the behaviors won’t get locked in. We’ll only do them when we consciously think about them. 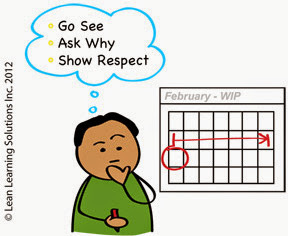 Let’s take - Going to Gemba and learning what to see and how to behave as an example. Many leaders pair up with a consultant (either internal or external) to help them as they begin. As a result the leader goes to Gemba once a month, meaning it will take many months or years before this behavior becomes habitual. In fact, research shows that behavior repeated only once a month almost never becomes a habit. As we begin to introduce new behaviors to Leaders, like going to Gemba, it’s best to repeat them daily or at a minimum weekly. Then the new behavior has a chance of becoming a habit and performed automatically. So how long does it take to form a new habit? It depends and varies widely but the best data I can find says - on average 62 repetitions. For leaders learning to go to Gemba that means it will take 6 months, on average, to form the habit if they go to Gemba 2 -3 times per week. 6 months for the behavior to become automatic. I’d love to hear from you. Any examples of new Lean behaviors that have become habits? What were some of the obstacles you faced?